Patal Ravan is not one of names of Ravana, the king of Lanka. Patala Ravana was a dear friend of the ten-headed Ravan. This demon got the name 'Patal Ravan' after he took refuge in Patal or the netherworld. His story is popular among the regional Ramayana stories in North India. Legend has it that fed up with the atrocities of Asuras (demons), Srihari Vishnu decided to annihilate them. Fearing the attack of Vishnu, a group of demons took refuge in Patala. The leader of this group was Ravan and thus he got the name Patala Ravana. Patal Ravan did intense tapas and pleased Brahma. As boon, Patala Ravan asked for the power to fly and also that he will only be killed when the ruby Bramarendra Neelam that he wears will be broken. Patal Ravan is also the nephew of Demon Malyavan - who was the chief advisor of demon king Ravana in the Ramayana. He also had a brother named Kumbodaran. Ravana, the king of Lanka, was impressed with the powers of Patal Ravan. They soon became thick friends. During Ram-Ravan war in the Ramayana, Patal Ravan kidnapped Sri Ram and Lakshmana who were sleeping in their tent. 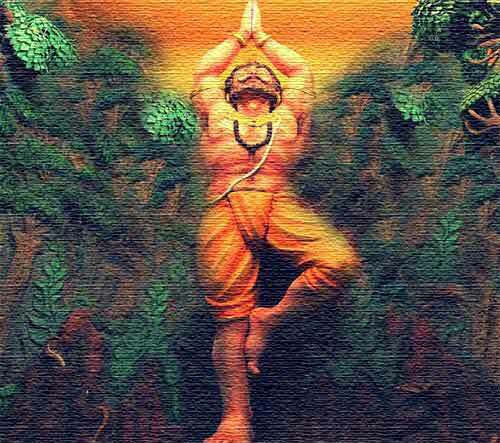 Hanuman who came to know about the powers of Patal Ravan followed him into the netherworld and killed Patal Ravan and rescued Sri Ram and Lakshman.